Cleaning your espresso equipment daily saves you money and allows you to get the most out of your investment. 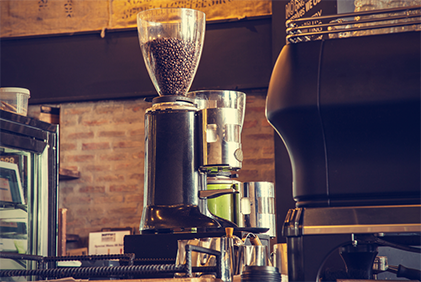 A clean machine means better coffee, and happier customers who will line up again and again. Learn how you can keep your equipment running like new with these handy maintenance tips. Open the steam wand to blow out residual milk. Wipe the steam wand with a damp cloth. Wipe or flush residual grinds from the brew head (screen). Rinse the brew handle and reinsert into the brew head to keep it warm. Backwash all brewing groups with a blind filter and  espresso cleaner. Brew and discard a single espresso to re-season the machine. Remove drip tray and grid and clean both thoroughly. Remove metal filters from the portafilter handles, and clean filter handles and filters thoroughly. Rinse well. Wipe all grounds from metal diffuser screens inside the brewing group. Wipe all surfaces clean, including work areas. If a build up of milk is present on the steam wands at the end of the day, soak them in a mixture of milk cleaner and  hot water until the build up can be wiped off. Vent the hot water spout to help prevent calcium build-up. Wash steaming pitchers, stainless steel spoons, brew  handles and brew filters with cleaner, according to  instructions on the label. Wipe down the grinder with a bar towel and a soft brush. Hand wash the tamper daily, removing any espresso  grinds. Empty and rinse out the used grounds in the knockbox. Wipe down the coffee machine, remove the spray head  area and clean it with a damp cloth. Wash out the brew baskets in warm soapy water and rinse well. Clean the inside of satellite shuttles with a scrub  pad/brush and baking soda. The outside can be wiped  down with a soft cloth. NOTE: Do not use cleaning  products such as fantastik®, Comet®, etc. 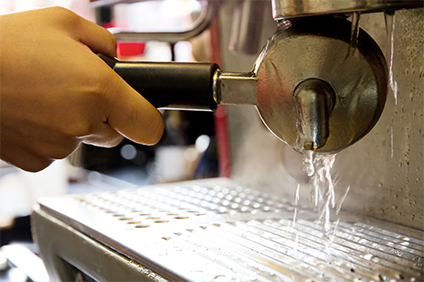 To clean the espresso machine, place espresso cleaner  into the portafilter and backflush with hot water. Use  cleaner on the dispersion screens, valves, brewing  passages and jets. Backflushing should take 30 seconds. Repeat five times until the water becomes clear. This  should be done twice a week. Unscrew the brew head screens from each brewing group  and let them soak in a solution of espresso cleaner and  water, according to the instructions on the label. Rinse  well and screw back on very securely. Check dates on water filters and softeners regularly, and  change every six months. Clean the hopper and lids of the grinder with a soft brush  by hand. These can be wiped out weekly with a damp  cloth. Soak the inside of the satellite shuttles with urn cleaner. Wash brew baskets, remove inserts, and clean the interior.